Take a free lesson on sand creations from world renowned sand sculptor Jeff Peterson at 11:30 AM. Learn how the pros create those amazing castles. Everyone is invited to come to this FREE event and build their own sand castle or sand art to win lots of PRIZES. Individuals or teams of any size are all welcome to create their vision and enjoy a day at the beach as sand artists. Prizes will be awarded to the top entries and as many keikis as possible. 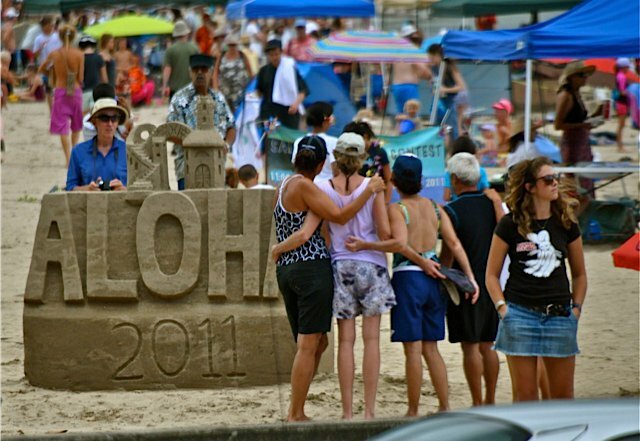 For keikis (kids), young and old, beginners, artists and sand sculptors. Realize your creative vision, get exercise, and work together with others. Prizes will be awarded for different age groups, individuals, teams and types of art. Take a break and enjoy the sand, surf and sun with family and friends. Bring your own shovels, pails, tools, molds, sprayers (very helpful) for sculpting sand. Make sure to bring your own hat or shade, sunscreen, food, drinking water and a squirt gun to help your friends cool off. Work by yourself or in teams. Prizes from Sponsors (to be announced) Anyone can give whatevers. Contact us if you are interested in sponsoring a prize for this event. If you want to help, want to give a prize (gift card from stores or individuals) or have suggestions please contact us: 808 639 8379 or fill out this form. Click on the images below to see full sized. Some of the contestants in 2011 gather for prizes. How to get there (location).